Used to be, I devoted all my September columns to banned books because I thought the topic so important. I don’t do that anymore, not because I’ve changed my mind about the right to read freely, but because the same titles keep showing up on the American Library Association’s “Most Frequently Challenged” list year after year. I’ve already written about most of those books. An American Indian teenager caught between two worlds. Gay penguins. A guilt-ridden boy in Afghanistan. A troubled African-American girl who can’t accept that she’s worthy of love. A “Where do babies come from?” book for children. This year, to celebrate the ALA’s Banned Books Week, which begins today, I’ve chosen to write about the book that came in at Number 10 in 2014—“Drama” by Raina Telgemeier. It’s a graphic novel, which—in case you’re old school like me and have never heard of such a thing—used to be called a comic book. They’re enormously popular among children and teens and deal with a variety of subjects ranging from the serious to the ridiculous. 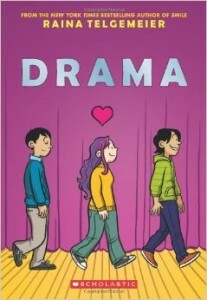 Telgemeier already had two bestselling graphic novels under her belt before “Drama” was published in 2012. Her earlier books were considered appropriate for all grade levels. “Drama,” not so much. Its protagonist is a seventh grade girl named Callie who’s in charge of set design for her school production of the musical “Moon Over Mississippi.” Readers who don’t know what goes into putting on a play will learn there’s more to it than simply finding cast members who can act and sing. Like props and costumes and lighting and publicity and working within a tight budget and a whole lot of other stuff. As if that weren’t drama enough, there’s the fact that the eighth grade formal is coming up and Callie can’t decide which of the two boys she has a crush on she’d rather go with. Not that either has shown any sign of asking her. So why would such a story be controversial? Because Justin, one of the actors in the play, is admittedly gay. “Yeah, I like boys,” he tells Callie. “I’m sure my dad suspects but we don’t discuss it.” To further complicate matters, Justin’s twin brother Jesse—one of the boys Callie hopes to date—may also be gay, though he’s just now realizing it. So might West, the star of the musical, who still hasn’t decided whether he’s straight, gay or bisexual. Though the topic of awakening feelings of homosexual attraction is handled gently and tastefully, it still comes as something of a jolt when reading a graphic novel written on the second grade level. Parents who have asked that “Drama” be removed from school libraries and classrooms assert that an easy-reader comic book shouldn’t deal with sexuality—gay or straight—at all. Others are upset that the illustration on the front cover and the blurb on the back give no hint that the book is about anything other than a middle school play and adolescent boy-girl crushes. “This book is nothing but a thinly-veiled attempt to get children to embrace homosexuality as normal and acceptable,” one parent complained. So who’s right? Why not read “Drama” for yourself and decide? It’s available at the Putnam County Library, which—this week and always—celebrates the right to read freely.